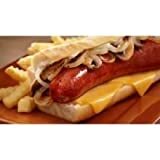 Save on Andouille at Smokey Robinson Foods. Top brands include Hoffy®, Leidy's, Johnsonville, & North Country Smokehouse. Hurry! Limited time offers. Offers valid only while supplies last. Johnsonville Natural Casing Smoked Andouille Sausage, 80 Ounce - 2 per case. Smoked Andouille Sausage 3 - 1 lb. Pkgs.